A Malaysia Airlines plane was sending signals to a satellite for four hours after the aircraft went missing, an indication that it was still flying, said a US official briefed on the search for the plane. The Boeing 777-200 wasn't transmitting data to the satellite, but was instead sending out a signal to establish contact, said the official, who spoke on condition of anonymity because he wasn't authorized to discuss the situation by name. Boeing offers a satellite service that can receive a stream of data during flight on how the aircraft is functioning and relay the information to the plane's home base. The idea is to provide information on whether maintenance work or repairs are needed before the plane lands so mechanics and parts can be ready, saving time and money. Malaysia Airlines didn't subscribe to that service, but the plane still had the capability of connecting with the satellite and was automatically sending pings, the official said. The continuing pings led searchers to believe the plane could have flown hundreds of miles or more beyond its last confirmed sighting on radar, the official said. The plane had enough fuel to fly about four more hours, he said. The plane was en route from Kuala Lumpur to Beijing when radar contact was lost. Messages involving a different, more rudimentary data service also were received from the airliner for a short time after the plane's transponder — a device used to identify the plane to radar — went silent, the official said. The plane was initially thought to have gone down over the South China Sea. According to defense officials, the USS Kidd, a destroyer, is heading into the Indian Ocean. A US surveillance plane is in the Strait of Malacca region and another U.S. surveillance plane is now en route to Malaysia, defense officials said. In latest related development, Malaysia Airlines has ‘retired’ the MH370 and MH371 flight codes as a ‘mark of respect’ to passengers and crew of the lost flight. “As a mark of respect to the passengers and crew of MH370 on March 8, 2014, the MH370 and MH371 flight codes will be retired from the Malaysia Airlines’ Kuala Lumpur- Beijing-Kuala Lumpur route,” the airline noted in a statement. “With effect from March 14, 2014, the new flight number to replace MH370 and MH371 will be: MH 318 (Kuala Lumpur – Beijing); MH 319 (Beijing - Kuala Lumpur),” it said noting that there will be no changes to the frequency of the services and that it will continue to operate double daily services to Beijing. “Our thoughts and prayers remain with the families of our colleagues and passengers of MH370,” the airline said. China said late Wednesday its satellites had detected three large floating objects in a suspected crash site near where the Malaysia Airlines plane, which disappeared Saturday on a flight from Kuala Lumpur to Beijing with 239 people on board, lost contact. But Vietnam said Thursday that two of its planes dispatched to the area had found no trace of the airliner. Reeling from a storm of criticism about its handling of the crisis, Malaysia also sent an aircraft to investigate the reported sighting in the South China Sea, pledging to pursue all "concrete clues" -- but that it had also found nothing as of Thursday afternoon. "Nil sighting," the Malaysian air force's director-general of operations, Affendi Buang, told AFP. The search for Malaysia Airlines flight MH370 -- which entered a sixth day Thursday -- has been blighted by false alarms, swirling rumours and contradictory statements about its fate. "I'm praying that I can give (them) back to him. It's all I can hold onto. Because there's no finality to it and we're not getting any information," she said. China's state science and technology administration said a satellite had captured images of the objects in a suspected crash area on Sunday, and the information was being analysed. China will keep up the search "as long as there is a glimmer of hope", Premier Li Keqiang said. The passengers included 153 Chinese citizens, and Li told his once-a-year press conference: "Those people's families and friends are burning with anxiety." It was not immediately clear why the satellite information has only just come to light. The region is criss-crossed by busy shipping lanes and littered with debris, complicating the search. Large oil slicks found by Vietnamese planes on Saturday yielded no trace of the Boeing 777, while previous sightings of possible wreckage proved to be false leads. The search for the plane now encompasses both sides of peninsular Malaysia, over an area of nearly 27,000 nautical miles (more than 90,000 square kilometres) -- roughly the size of Portugal -- and involves the navies and air forces of multiple nations. Theories about the possible cause of the disappearance range from a catastrophic technical failure to a mid-air explosion, hijacking, rogue missile strike and even pilot suicide. The objects detected by the Chinese satellite were seen roughly 200 kilometres (124 miles) east of the location of the plane's last reported contact roughly mid-way between the coasts of Malaysia and Vietnam. "That would make sense if the debris were there," said Gerry Soejatman, a Jakarta-based independent aviation analyst. "It is very possible that this could be it. The satellite image is what is seen at the time the debris would have drifted and/or sunk by then. It can be calculated to find where it is now." The objects were spread across an area on the eastern-most margin of the original search zone, with a radius of 20 kilometres (12 miles). The new information prompted the focus of the search to swing back to the original flight path, after a shift in recent days to Malaysia's west coast -- far from the last known location. "We will look at all areas especially the ones with concrete clues," a spokesman for Malaysia's civil aviation department said after the Chinese announcement. But Vietnam Civil Aviation Authority deputy director Dinh Viet Thang told AFP that two aircraft sent to inspect areas near where the suspicious objects were detected by China "have returned and we found nothing so far". Earlier, he said Vietnamese officials had only seen the report of the sighting on the Internet, raising fresh questions about the coordination of the huge search. And the US Navy, which is contributing two destroyers and two surveillance planes to the vast search, appeared to be treating the latest news with caution. "I do not have specific information about that satellite image," Commander William Marks of the USS Blue Ridge, the command ship of the US Seventh Fleet, told CNN. The China Centre for Resources Satellite Data and Application said in a statement on its website earlier this week that it had deployed eight land observation satellites to scour the suspected crash area. By Tuesday morning, it had obtained images covering 120,000 square kilometres, describing their quality as "rather good". China has also requested assistance from a fleet of Earth-monitoring satellites under an international charter designed to aid emergency efforts. US authorities said their spy satellites had detected no sign of a mid-air explosion. In a new twist, Malaysian police said Thursday they were investigating the two pilots, after an Australian television report of a past cockpit security breach. Malaysia Airlines has said it was "shocked" over allegations that First Officer Fariq Abdul Hamid, 27, along with a fellow pilot, violated airline rules in 2011 by allowing two young South African women into their cockpit during a flight. It also emerged that months before the Malaysia Airlines jet vanished, US regulators had warned of a "cracking and corrosion" problem on Boeing 777s that could lead to a drastic drop in cabin pressure and possible mid-air break-up. On Thursday, Malaysia Airlines said it would retire the flight codes MH370 and MH371 as a mark of respect. 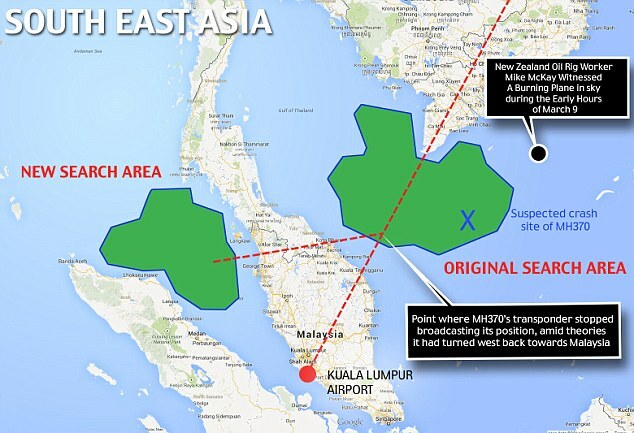 This map shows the two areas where the search for flight MH370 was focused in green. The blue X marks the spot where the large debris has been spotted by Chinese satellites. The black circle is where the New Zealand oil worker witnessed a plane burning in the sky. The last radio transmission from the cockpit of missing Malaysia Airlines flight 370 was "Alright, good night", Kuala Lumpur's ambassador to Beijing reportedly said Wednesday during a meeting with Chinese relatives. Iskandar Sarudin was speaking to passengers' relatives and friends at a Beijing hotel. The "alright, good night" comment from one of the pilots came as the flight switched from Malaysian to Vietnamese airspace, Singapore's Straits Times newspaper quoted the ambassador as saying. As confusion deepens over the search area and whether Malaysian military radar tracked the aircraft, he said "now is not the time" to reveal what information the military had supplied civilian authorities. Meanwhile, Malaysia has sought India's help to locate a missing jetliner, India's foreign ministry said on Wednesday, as the search expanded to cover an area stretching from China to the Andaman Sea. "Malaysia and India are in contact on this since yesterday and contact points are being discussed. These contact points will ascertain what assistance is required and what India can offer," a spokesman at the ministry said. The spokesman said it had not yet been decided what area India would search in. India has a large military command in its Andaman and Nicobar islands and its navy patrols in the straits of Malacca. Malaysia Airlines said Tuesday it was "shocked" by allegations aired in an Australian news programme of a past cockpit security breach involving the co-pilot on its missing passenger jet. Malaysia Airlines MH370 vanished early Saturday on an overnight flight from Kuala Lumpur to Beijing with 239 people aboard. No trace of the plane or evidence of its fate have been found. Among those aboard were First Officer Fariq Abdul Hamid, 27, who along with a fellow pilot violated airline rules in 2011 by allowing two young South African women into their cockpit during a flight, one of the women told Sydney-based Nine Network. The report included photos of the women in the cockpit, with one appearing to show them posing with a man resembling Fariq. Passengers have been prohibited from entering the cockpit during a flight after the 9/11 attacks on the United States. About 600,000 people have scanned satellite images from DigitalGlobe Inc. for clues to the fate of a missing Malaysia Airlines jetliner, the company said Tuesday. Users of the website can tag images if they see wreckage, life rafts, oil slicks or other evidence. DigitalGlobe is calling it a crowdsourcing campaign to help search crews. The company plans daily updates of the images on the search website, http://www.tomnod.com. - The international search for a missing Malaysian airliner has been expanded into the Andaman Sea, hundreds of kilometres (miles) to the northwest of the original search radius, an official said Wednesday. - China's air force will add two planes to the search for a missing Malaysia Airlines jetliner, the country's civil aviation chief said on Wednesday, adding that search and rescue efforts would be broadened to include land areas. Li Jiaxiang, Chairman of the Civil Aviation Adiministration of China, made the comments on the sidelines of China's annual parliament. - Malaysia's air force says jet may have turned back, denies saying it reached Malacca strait . - Vietnam suspends air search for missing Malaysian jet, say officials. In one of the most baffling mysteries in recent aviation history, a massive search operation for the Malaysia Airlines (MASM.KL) Boeing 777-200ER has so far found no trace of the aircraft or the 239 passengers and crew. At the time it lost contact with civilian air traffic control, the plane was roughly midway between Malaysia's east coast town of Kota Bharu and the southern tip of Vietnam, flying at 35,000 ft (10,670 metres). Malaysia's Berita Harian newspaper quoted air force chief Rodzali Daud as saying the plane was last detected at 2.40 a.m. by military radar near the island of Pulau Perak at the northern end of the Strait of Malacca. It was flying about 1,000 metres lower than its previous altitude, he was quoted as saying. "We are looking very closely at the video footage taken at the KLIA (Kuala Lumpur International Airport), we are studying the behavioural pattern of all the passengers." A huge search operation for the plane has been mostly focused on the shallow waters of the Gulf of Thailand off Malaysia's east coast, although the Strait of Malacca has been included since Sunday. "The more information we get, the more we are inclined to conclude it is not a terrorist incident," Noble said. "We believe he is not likely to be a member of any terrorist group, and we believe he was trying to migrate to Germany," Khalid said. Asked if that meant he ruled out a hijack, Khalid said: "(We are giving) same weightage to all (possibilities) until we complete our investigations." China has deployed 10 satellites using high-resolution earth imaging capabilities, visible light imaging and other technologies to "support and assist in the search and rescue operations", the People's Liberation Army Daily said. The international police agency Interpol does not believe the disappearance of a Malaysia Airlines plane was the result of a terrorist attack, its head said on Tuesday. Interpol Secretary General Ronald Noble also suggested that two men who boarded using stolen passports and had aroused suspicion may have been smuggled by traffickers. The plane, with 239 people on board, has been missing for four days and a search involving crews from 10 countries widened on Tuesday to a larger swathe of the Gulf of Thailand and South China Sea. Two Iranian passport holders aged 18 and 29, who started their trip in Doha, had swapped their passports in Kuala Lumpur and used stolen Italian and Austrian passports to board the airliner, he told reporters at Interpol's headquarters in Lyon. "We know that once these individuals arrived in Kuala Lumpur on the 28th of February they boarded flight 370 using different identities, a stolen Austrian and a stolen Italian passport," he said. Neither of the Iranian passports were reported stolen or lost. Interpol is working with member countries to follow all leads including "terrorism, organised crime, illegal movement of people, whether in the form of human trafficking or smuggling," Noble said. Making public the names of the two individuals listed on the Iranian passports - Pouri Nourmohammadi and Delavar Seyed Mohammadreza - might compel family and friends to offer tips that could allow authorities to exclude terrorism theories, Noble said. "By doing this, eventually, with more and more evidence, we'll able to exclude they were involved in conduct that might have involved the plane to disappear and focus on eliminating the human trafficking ring that allowed them to travel." In a bizarre twist to what is already a tragic mystery, Washington Post reported some relatives claimed when they called the cellphones of those on the flight, or found them on Chinese instant messenger service - QQ - indicated that the phones were still online and ringing. "We believe he is not likely to be a member of any terror group and we believe he was trying to migrate to Germany," said Malaysia's national police chief Khalid Abu Bakar. Khalid said authorities had not yet identified the other man. Relatives of Chinese passengers on Malaysia Airlines' missing flight MH370 were still clutching to faint straws of hope for their loved ones Tuesday, as the search entered a fourth day. Families and friends of many of the 153 Chinese passengers -- more than two-thirds of those on board the flight to Beijing -- are gathered at the Lido Hotel in the city, waiting for news. Helicopters and planes criss-cross the sky as scores of boats search below -- but officials say the multi-national hunt for missing flight MH370 is like looking for a needle in a haystack. Malaysia on Monday doubled the search radius to 100 nautical miles (equivalent to 185 kilometres) around the point where Malaysia Airlines MH370 disappeared from radar over the South China Sea early Saturday. "The biggest problem is just knowing where to look -- especially at night," Vo Van Tuan, a top Vietnamese military officer who is leading Vietnam's search effort, told AFP. The vastness of the search zone reflects authorities' bafflement over the plane's disappearance. On the fourth day of searching, the operation had grown to involve 42 ships and 35 aircraft from Southeast Asian countries, Australia, China, New Zealand and the United States. Japan said Tuesday it was sending a plane to join the search efforts. Vietnam has mobilised its first major search and rescue operation, deploying aircraft, boats and its commercial fishing fleet to help Malaysia search for the jet -- even as relatives of the 239 people aboard said their hopes for a miracle were ebbing away. The hunt to discover the plane's fate will likely be "a long mission that requires patience," Vietnamese Major General Do Minh Tuan told AFP as he flew on a military helicopter near the country's southern Tho Chu island. "If the plane crashed and sank, some debris will surface, and if we find that we will be able to pinpoint the location of the plane," he said. But multiple reports of "suspicious floating objects" have revealed nothing but flotsam, tired Vietnamese rescue officials, putting in 20-hour days, concede. In southern Phu Quoc, normally a sleepy tourist town, hundreds of foreign journalists -- who usually face strict visa restrictions -- have arrived after the government set up a search and rescue base at the airport. Officials have taken over rooms in the air traffic control tower at the new Phu Quoc international airport, where the atmosphere is calm and organised, but sparsely furnished rooms hint at Vietnam's limited resources. The communist country "has minimal capabilities for search and rescue at sea," said Vietnam expert Carl Thayer, adding it was geared more towards dealing with natural disasters such as typhoons. "The longer the search continues (Vietnam) will have problems sustaining its commitment," he said. The total search sphere now includes land on the Malaysian peninsula itself, the waters off its west coast, and an area to the north of the Indonesian island of Sumatra. Vietnam has said it will search on land if needed. Malaysia Airlines says west coast of country now the focus of search for missing plane. China has deployed 10 satellites to help in the massive air and sea search for a missing Malaysian airliner, the People's Liberation Army Daily said on Tuesday. The satellites will use high-resolution earth imaging, visible light imaging and other technologies to "support and assist in the search and rescue operations for the Malaysian Airlines aircraft", the newspaper said in an article that was also carried on the defence ministry's website. China has urged Malaysia to speed up the search for the plane. About two-thirds of the 227 passengers and 12 crew now presumed to have died aboard the plane were Chinese. The Chinese satellites will also help in weather monitoring, communication and search operations in the area where the plane disappeared, the newspaper said. China will also strengthen the Beidou navigation system's satellite monitoring capabilities to "provide reliable navigation for the rescue operations and communication support". Vietnam has scrambled rescue helicopters to check a "yellow object" floating in its waters that rescue teams suspect could be a life raft from a Malaysian plane that went missing with 239 people aboard, a minister said on Monday. A Vietnamese jet had seen the object earlier on Monday but was unable to get close enough to determine what it was, Pham Quy Tieu, Vice-Transport Minister and deputy head of the country's rescue committee, told Reuters. The Civil Aviation Authority of Vietnam said on its website searches were being conducted about 140 km southwest of Tho Chu island, which is located about 200 km off the coast of southern Vietnam. An international search and rescue effort still had not found any confirmed debris from a Malaysia Airlines jet more than two day after it mysteriously went missing, an official said Monday. "Unfortunately, ladies and gentleman, we have not found anything that appears to be objects from the aircraft, let alone the aircraft itself, said Azharuddin Abdul Rahman, head of Malaysia's Department of Civil Aviation. He also said Vietnamese officials had not yet confirmed to Malaysia reports that debris believed to be from the plane had been found. China's Foreign Ministry on Monday urged Malaysia to step up search and investigation efforts over a missing Malaysia Airlines jetliner with 239 people on board. Ministry spokesman Qin Gang made the comments at a daily news briefing. Vietnamese aircraft spotted what they suspected was one of the doors of a missing Boeing 777 on Sunday. Searchers in a low-flying plane also spotted an object that appeared to be one of the plane's doors, the state-run Thanh Nien newspaper said, citing the deputy chief of staff of Vietnam's army, Lt Gen Vo Van Tuan. Two ships from the maritime police were headed to the site about 60 miles (90 kilometers) south of Tho Chu island in the Gulf of Thailand, the same area where oil slicks were spotted Saturday. "From this object, hopefully (we) will find the missing plane," Tuan said. Officials investigating the disappearance of a Malaysia Airlines jetliner with 239 people on board suspect it may have disintegrated in mid-flight, a senior source said on Sunday, as Vietnam reported a possible sighting of wreckage from the plane. International police agency Interpol confirmed that two passengers on the flight had used stolen Austrian and Italian passports, raising suspicions of foul play. Nearly 48 hours after the last contact with Flight MH370, mystery surrounded its fate. Malaysia's air force chief said the Beijing-bound airliner may have turned back from its scheduled route before it vanished from radar screens. Boeing, the maker of the 777-200ER, declined to comment and referred to its earlier statement which said it was monitoring the situation. Dozens of military and civilian vessels have been criss-crossing waters beneath the aircraft's flight path, but have found no confirmed trace of the lost plane, although oil slicks have been reported in the sea south of Vietnam and east of Malaysia. Late on Sunday, the Civil Aviation Authority of Vietnam said on its website that a Vietnamese navy plane had spotted an object in the sea suspected of being part of the plane, but that it was too dark to be certain. Search planes were set to return to investigate the suspected debris at daybreak. Possible debris from vanished Malaysia Airlines flight MH370 was found in the sea off Vietnam by a search team Sunday, a senior official said. It was the first time that authorities had given any positive indication that traces of the Boeing 777, which disappeared in the early hours of Saturday carrying 239 people, may have been discovered. "We received information from a Vietnamese plane saying that they found two broken objects, which seem like those of an aircraft, located about 50 miles to the south-west of Tho Chu Island," said the senior from official from the National Committee for Search and Rescue, who did not want to be named. "As it is night they cannot fish them out for proper identification. They have located the position of the areas and flown back to the land," he added. Tho Chu island is part of a small archipelago off the south-western tip of Vietnam which belongs to the communist country. Two large oil slicks which authorities suspect were caused by jet fuel were detected late Saturday further south off the island chain. The pilot of a Malaysia Airlines jet that went missing on Saturday enjoyed flying the Boeing 777 so much that he spent his off days tinkering with a flight simulator of the plane that he had set up at home, current and former co-workers said. Zaharie Ahmad Shah, 53, captain of the airliner carrying 239 people bound for Beijing from the Malaysian capital, had always wanted to become a pilot and joined the national carrier in 1981. Airline staff who worked with the pilot said Zaharie knew the ins and outs of the Boeing 777 extremely well, as he was always practicing with the simulator. They declined to be identified due to company policy. "He was an aviation tech geek. You could ask him anything and he would help you. That is the kind of guy he is," said a Malaysia Airlines co-pilot who had flown with Zaharie in the past. Zaharie set up the Boeing 777 simulator at his home in a suburb on the outskirts of the Malaysian capital where many airline staff stay as it provides quick access to the Kuala Lumpur International Airport. Zaharie's passion for aviation went beyond the Boeing 777. Other photos posted up by him on Facebook show he was an avid collector of remote-controlled, miniature aircraft, including a lightweight twin-engined helicopter. Zaharie was certified by Malaysia's Department of Civil Aviation (DCA) as an examiner to conduct simulator tests for pilots, said several officials from Malaysia Airlines. They said it was impossible that Zaharie would be in any way to blame for the disappearance of the aircraft. "He knew everything about the Boeing 777. Something significant would have had to happen for Zaharie and the plane to go missing. It would have to be total electrical failure," said another Malaysia Airlines pilot who knew Zaharie. Zaharie has flown Fokker F50s, Boeing 737s and the Airbus A300 in over three decades with Malaysia Airlines. He had over 18,000 hours of flying experience. His 27-year-old co-pilot Fariq Abdul Hamid had clocked 2,763 hours - having joined Malaysia Airlines in 2007. "The Boeing 777 doesn't just stall like that," said a former Malaysia Airlines pilot who works for a rival airline. "It is one of the safest planes out there. It doesn't just fall out of the sky like that." Authorities have now said they were expanding their search for wreckage to the west coast of Malaysia. Searches so far had concentrated on waters to the country's east, in the South China Sea. A missing Malaysia Airlines jetliner may have turned back from its scheduled route before vanishing from radar screens, military officers said on Sunday, deepening the mystery surrounding the fate of the plane and the 239 people aboard. More than 36 hours after the last contact with Flight MH370, officials said they were widening the search to cover vast swathes of sea around Malaysia and off Vietnam, and were investigating at least two passengers who may have been using false identity documents. Despite dozens of military and civilians vessels and aircraft criss-crossing waters to the east and west of Malaysia, no wreckage has been found, although oil slicks have been reported in the sea south of Vietnam. "What we have done is actually look into the recording on the radar that we have and we realised there is a possibility the aircraft did make a turnback," Rodzali Daud, the Royal Malaysian Air Force chief, told reporters at a news conference. There were no reports of bad weather and no sign of why the Boeing 777-200ER disappeared about an hour after it took off from Kuala Lumpur bound for Beijing early on Saturday. The 11-year-old Boeing, powered by Rolls-Royce Trent engines, took off at 12:40 am (1640 GMT Friday) from Kuala Lumpur International Airport when it went missing without a distress call. Aboard were 227 passengers and 12 crew. It last had contact with air traffic controllers 120 nautical miles off the east coast of the Malaysian town of Kota Bharu. Flight tracking website flightaware.com showed it flew northeast after takeoff, climbed to 35,000 ft (10,670 metres) and was still climbing when it vanished from tracking records.